In the spring of 2012, I was invited by the Tang Museum to create a work specifically for their project We the People which explores constitutions and how they act to create order, configure communities, and form a collective identity. Using the U.S. Constitution and the fall presidential elections as catalysts for conversation and debate, the exhibition serves as a dynamic laboratory for exploring constitutions as a process, embodied by the people who create them and for whom they serve. Three artists including myself, Francis Cape, and Nari Ward, transformed the Payne Room of the Tang Museum in the spirit of convention halls and town halls to evoke and critique ideas of patriotism, community, citizenship, and activism. For From Many One, From Anyone I drew upon American quilts’ associations to democracy, collectivity and anonymity. I sometimes invoke the quilting bee metaphor to describe my practice, in which sculptures provide an occasion for gathering, an arena or platform for discussion. 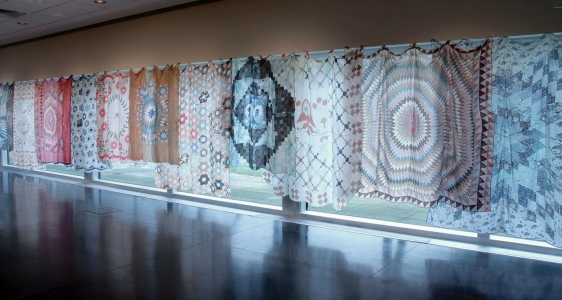 The "quilt" holds the residue of that experience, giving the art object an artifact quality that points back to the conditions and conversations of its making. The word “thing/ting” in old German can mean both an object and a gathering to discuss a contested matter, and that is how I think about the thingness of sculpture. For this work, I have appropriated printed images of quilts by mostly anonymous makers that include elements of political or patriotic imagery, including flags, eagles, and presidents, for example. Many of these quilts incorporated commemorative textiles such as printed bandanas and scarves into their designs. Others feature more abstract symbolism suggesting radiance, explosion, spinning, or kaleidoscopic views.